Really very little time spent working on the car mainly due to my desire to get the exhaust system sorted. Unfortunately this was delayed by the rather busy nature of Custom Chrome, their somewhat 'optimistic' delivery estimates and the courier company taking a week to deliver the parcels marked "Next Day"! However, that being said, the items arrived today although I have not yet had chance to go over to my parents place (where the Rush is being made) to check the items out. Now I can really crack on with something this weekend. Additionally another courier company tried to deliver my instruments today (this time to my house) but there was no one home. I've ordered the items from Greengauges over the Internet, white faces, blue numerals and red pointers, all surrounded by a half round aluminium bezel. I'll have to call the courier company to get them to deliver later this week. Busy winter days ahead!! Well, the kit of parts from Custom Chrome is to say the least a little more involved than I imagined. Basically the manifold kit comprises of 36 mild steel bends, 8 Rover manifold flanges and two 4 into 1 collectors. The bends are cut to fit (it's up to you how you use them) and then welded together, and then into the collector. The collector outlet also needs to be welded to the collector itself. The whole lot then connects into the chromed 'Megazone' silencers. 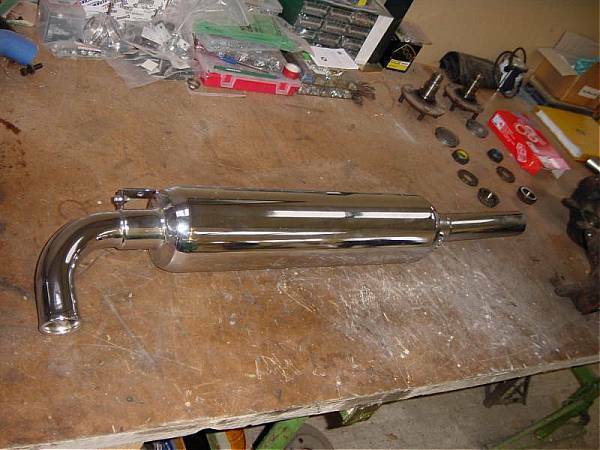 The 'Megazone' is a 5" diameter silencer recommended for higher BHP applications. Well you've got to keep an eye on the future. So I set about mounting one of the silencers to give me something to aim at with the manifold kit. Problem is that the 'Megazone' mounting bracket requires fixing to the side panel, at a point where there is no steel to support it. So I've 'Wurthed' an ally sheet to the inside of the GRP side panel and then fixed a steel 'L' bracket to the lower chassis rail. The bobbin thread passes through both. It seems secure but over time, I think the 'L' bracket may fail since it is made from a too lighter gauge of mild steel. I will get some beefier ones made up prior to fitting the other side. I've taken the collectors to work for our mechanical guys to tack together. They were surprised at the amount of welding required and began to regret their kind offer of assistance. I'm fast coming to the conclusion that in order to get the exhaust together reliance on favours will mean that it will take a very long time. So I've virtually convinced myself that a MIG set of my own is the only way to get the job done quickly. Never welded in my life so it's in at the deep end!! However in order to fit the manifolds I've first got to cut holes in the side panels. I've gone for the two elongated holes per side approach, each 80mm wide with 40mm radius semicircle at each end. In retrospect, although 80mm looks correct in the overall scale / look of the car, its too big for the diameter of the manifold pipes. 80mm was chosen to ensure that the flanges would clear, but I've been a tad generous. 70mm would probably be better. Trev's Tips:- Don't be tempted to copy the measurements for the manifold holes from the nearside to the offside or vice versa. This is because the offside exhaust ports are 25mm further to the rear of the engine than the nearside. Near miss for yours truly!! Meanwhile, the gauges arrived from Greengauges. Very nice but I've goofed. The speedo and tacho (100mm) gauges don't fit the contoured dashboard. Fortunately the Greengauges people agreed to me returning them in exchange for two 80mm items. This was not without some cost to me however, that being that the price difference was not refunded and a second £12 of P&P. Might take issue with them on that one. Whilst I wait for the collectors to be tacked, I set about the Efi loom. It's miles too long and some of the connectors are not required as I've no aircon or fuel vapour tank to purge! First process was to fit the ECU. After much soul searching I've mounted on the inner face of the scuttle, in front of the passenger. I hope that it doesn't foul the wiper motor and leaves room for the heater. Next I un-loomed the loom in order to adjust the wire lengths to suit their new position in the engine bay. At this point I made the decision to remove the wiring associated with the aircon system and purge valve. 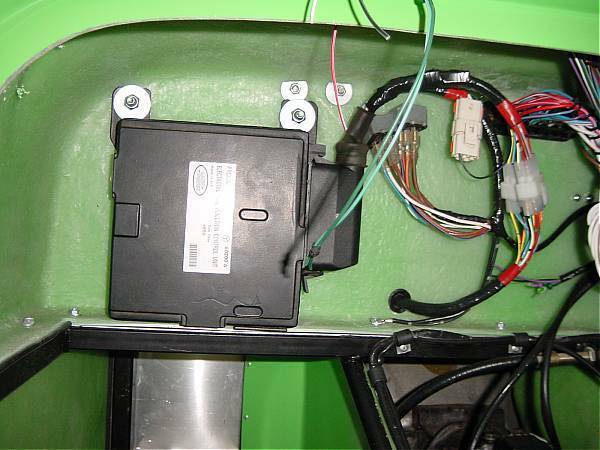 As far as I can make out from the Hot Wire schematics, this ought not to upset the running of the ECU/Efi system. The only possible problem is that the ECU, by virtue of the fact that it now has four connections that connect to free space, might try to run the engine faster/richer as if the aircon was on (i.e. to stop the engine slowing when the aircon kicks in). We'll just have to see. Conversely the lack of a purge valve connection might make the engine run slower when it expects the contents of the fuel vapour tank to be dumped into the engine. We'll have to see again. Anyway I'd have the same problem if I left the wires, connectors and fan timer unit in place since I've nothing to connect them to. If I do have problems, I hope that through the judicious use of a few wire 'jumpers' or 10k resistors I can trick the system into believing that it has aircon but it switched off. I think that I am going to have bigger hassle with the road speed sensor anyway. I also noticed at this junction that the tuning resistor is missing. No tune resistor selects the 'limp home' ECU map, which is a cat tune. I Will to buy a 'green' 470 ohm tune resistor from Rimmers or to save cash the resistor direct from RS or Maplins. Will also need to sort out the 510 ohm resistor that connects into the loom to disable the autobox start inhibit (i.e. select neutral or park to start). This might make a really good antitheft device if I can engineer it in to dash. So that the Efi loom plug can pass through the bulkhead, you need to cut a hole of some 45mm diameter and plug it with a large grommet. Didn't like the sound of this so snip-snip and hey-ho a Rover Efi loom in two bits. It had to be cut anyway as it was at least a metre too long. Day off tomorrow so it's out with the crimping tool and the ripault connectors to put it all back together again. As mentioned above, I set about re-assembling the Efi loom once it had been passed through the scuttle bulkhead. Just a question of crimping on the connectors and matching up the colours. I've been researching the Efi system in some detail to try to determine the effects of the missing Land Rover ancillaries. I think that much of the non-existent stuff can be replaced by setting the appropriate ECU plug connector to 0v or 12v. The only real problem might be the road speed sensor. However, after reading the Haynes manual, I have come up with a cunning plan. According to the book, if you jack up the rear of a Range Rover and spin the nearside rear wheel slowly by hand, you should get 6 changes from 0v to 12v and back per minute. Assuming by slowly they mean one revolution every 10 seconds (very BIG assumption), that means that you get 6 sensor pulses for every 6 wheel revolutions, or one pulse per wheel revolution. If you say that the rear differential ratio is 4:1 approximately, then the prop shaft rotates four times per pulse. I will be putting four magnets on the propshaft for the speedo so that means that I will get sixteen pulses per wheel revolution. In order to get this back down to one per revolution, I will knock up a ÷16 circuit (the electronics background comes in useful here) and Bob's your Mum's brother......I hope! I have annotated the drawing of the 1990 Efi Hot Wire system so that I can keep track of what I am doing. Click here to view it (it's a 270k JPEG for clarity, I will try to reduce it to a more manageable size another time). The modified thermostat housing arrived from Dax today. They've (Gary) done a very good job on it and followed the guide drawing that I'd sent to them to ensure that it was 'just right' to suit the higher LR front timing cover. All that I need now is a length of Vulcoflex hose and the cooling system is done (excepting the heater). The very nice blue silicone flexi hose that I bought for the thermostat to radiator connection is not flexi enough. Waste of £30, any offers for a metre of 32mm blue silicone 'flexi' hose? ?